The 'VOC-Huys' is a listed building which dates from 1777 and was completely renovated. 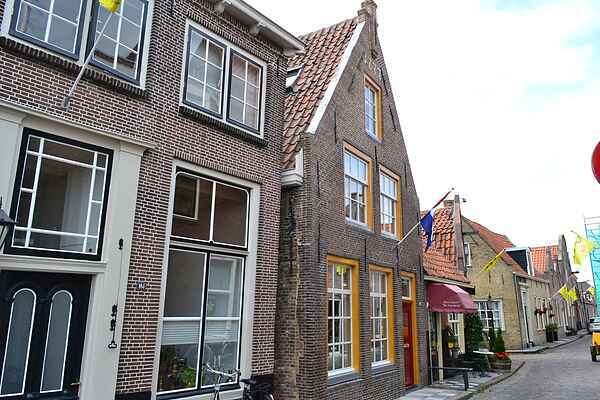 It is located in one of the most beautiful spots in Enkhuizen's historic city centre, just a stone's throw from the IJsselmeer. It radiates an ambience of times gone by, while offering all the luxury and conveniences of today. You have a water view of the IJsselmeer from the 1st and 2nd floors. On the ground level there is a small courtyard behind the house, while the 2nd floor contains a loggia, both with garden furniture. The 1st floor contains a 2-person sleeping alcove (1.40 x 2 m). The interior design boasts a rustic and traditional style but without sacrificing comfort. You have a sauna, a hot tub with shower, a massage shower, an extra TV in one of the bedrooms, box spring beds and a media centre. Outside the house as well, Enkhuizen and the surrounding area offer plenty to keep you amused. Among the attractions are the Zuiderzee Museum, sunbathing at Enkhuizer Zand, swimming in a great indoor pool, a trip to the Sprookjeswonderland fairy-tale theme park and a large playground for the kids it's all possible right here. You can also visit the famous cheesemaking town of Alkmaar, the capital city of Amsterdam, or Bataviastad (an outlet shopping centre). The North Sea coast is just 30 km away as well. But of course the IJsselmeer is also a great place to spend some time. With all this and more, you are sure to have a fantastic holiday!